Robert is in his early 30s and is looking relieved. “I have just been with my seven year-old son for his eye test and all is fine – I am so pleased,” he says. Around 30 years ago, Robert was not so lucky. When he was about 3, his mum noticed that when he looked at her, his eyes weren’t straight. “It was a common problem – I had a lazy eye. 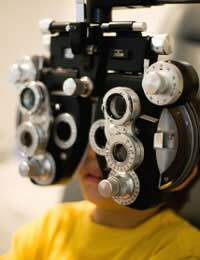 Mum took me to the optician and then I was referred to hospital but I don’t really remember much about it, until I started school,” says Robert. A lazy eye is a term used to describe mis-alignment of one or both of the eyes. In Robert’s case, his right eye pointed inwards instead of straight ahead. The wiring for sight in the brain only matures when each eye receives images and information. A lazy eye is capable of working perfectly normally but the signals don’t get into it and to the brain correctly. The sight in the eye therefore fails to develop so, as well as not being straight, the eye doesn’t function properly. “My mum was told that, in order to get as much information into the eye as possible, I needed a small operation to straighten it up, which I had, and then I had to make the lazy eye start to work hard so that my eyesight in that eye would improve. This involved wearing a pair of glasses with a sticky patch over my good eye,” explains Robert. When Robert was 7, he was made to go to school every day with the glasses and an eye patch. When the other children started calling him names, like ‘speccy-four-eyes’ and ‘patch’, he used to wear the glasses to school but would then hide them in his coat pocket. “Unfortunately, my mum had been into school so I only got away with that for about a week,” remembers Robert. The answer that the doctor came up with was to actually stick a patch over Robert’s eye by sticking it on his face. “That was even worse and I got teased even more,” says Robert. Although he was only at primary school, some of the other children were particularly cruel and as well as taunting Robert for having to wear the patch, they would gang up on him at lunchtime and try to pull the tape off his face. “I started going home with really red marks and sometimes my skin was bleeding by the time my mum took the patch off at night. She actually took me back to the doctor because she thought the adhesive on the tape was giving me a bad skin reaction,” recalls Robert. For a few months, Robert went back to the glasses and patch system but this didn’t make the bullying ease off. If anything, it got even worse. “I started pretending to feel sick – actually I didn’t have to pretend, I used to be nearly sick with worry that I had to go to school. My mum didn’t take much notice though so, one day, I skipped back out of the school gates after she had gone and decided to play truant. I would have done anything than put up with another day of bullying,” he says. Fortunately for Robert, one of his friend’s mums, who worked in a hairdresser in their local town noticed him wondering about and went to see what had happened. “My mum had gone to work at offices in London that day, so she ended up calling the police – I shall never know why she did that rather than just take me back to school but, in the end, it turned out to be the best thing,” says Robert. Truancy in an 8-year old boy was not exactly unusual, but it was rare in the town where Robert lived. “A nice man, who was apparently a retired officer, ended up talking to me. I just told him the whole story. When my mum came to collect me, he told her what had happened and that was when things started to improve,” says Robert. Robert’s mum had not been feeling very happy at work over the recent months and her day in London was actually an interview. “We ended up moving a few weeks later to a suburb of London and I went to a different school and got ordinary glasses at last. Thankfully, I was never bullied again but that’s why I am so glad my own son has perfect eyesight – I would never want him to go through that,” smiles Robert.